Clarets boss Sean Dyche has brushed off stories of Danny Ings’ weekend trip to Spain - joking the top-scorer brought him back a nice present! Ings flew to meet up with David Moyes and discuss a switch to Real Sociedad when his contract expires in the summer. File photo dated 02-12-2014 of Burnley's Danny Ings. PRESS ASSOCIATION Photo. Issue date: Friday January 30, 2015. Burnley have denied reports Liverpool could sign striker Danny Ings and loan him back to the Clarets for the rest of the season, stating such a move would be against Premier League rules. See PA story SOCCER Liverpool Ings. Photo credit should read Lynne Cameron/PA Wire. On a serious note, Dyche has no issue about Ings using his right to speak to interested parties from abroad: “There is no concern from me. I have said all along, his performances make it quite obvious he is enjoying his football. “He looks relaxed. One of the biggest things I have said to him for the last two years I have been here, other than tactical pointers, is smile and enjoy your football and there’s no reason why he shouldn’t do that. Ings has been tipped for a call up for the England squad to face Italy next month, alongside Spurs’ Harry Kane and former Claret Charlie Austin. Dyche admitted last week in Express Sport he feels Ings merits the recognition, and added: “I can’t speak for the others but Danny has certainly put himself on the map. “His progress in the Premier League shows that and I can only imagine that the powers-that-be in the England set-up will take that seriously. “I think he is a valuable player in the future for England and I would imagine they are at least keeping tabs on what Danny is doing at full international level. “I know Gareth (Southgate) does anyway. He speaks to me and goes to watch him and I think his messages to the top will be one that he should certainly be considered. 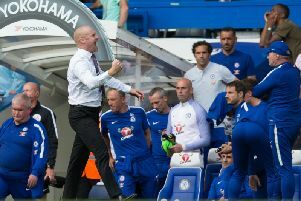 And ahead of Saturday’s game at Chelsea, Dyche doesn’t doubt Ings’ commitment: “I have no reason to doubt his thoughts about Burnley Football Club and what we’re doing. You tell that by his performances.